Tracy’s daughter came with her computer and showed us the latest revisions for our Logo. We love the new design (no spoon, quilted cherry) and will be receiving the graphic soon. There will also be a button so everyone can add the button to their blog. With the new space at Sewtropolis we will be having sew-in’s every other month. The first Sew in will be June 23rd, 12 noon to 8p. Bring your sewing machines, projects and snacks. Flaun gave an update on Jacque from Tall Grass Prairie Studio visit. Tentatively the visit is set for September 14 & 15. Sewtropolis will host a Trunk Show on Friday and Jacquie will provide a workshop on Saturday. More information will be provided as the visit gets closer. Fluan also talked about donations to Women’s Advocate. It was decided that during the Sew In we would work on quilts for this charity. We then drew names for the Block Lotto and _______ (sorry, I know I should know your name - but it's escaping me now) The next Block Lotto will be the Granny Square. For this month we will make 12 blocks and do a cookie swap so that we all leave with 12 different blocks. You can find a tutorial on strip piecing the blocks here. Due to a lot of our regular members not being at the meeting we decided to wait till May to do the Quilt-Con Block Challenge swap. For those of you who dropped off fabric it is in safe keeping with Annik she will bring them back in May. For those of you who would still like to attend please bring a yard of any color of the challenge fabric, cut into fat eighths. 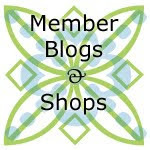 If you're curious what everyone else is doing, you can join the QuiltCon Flicker group here. Because quite a few of us will be at Quilt Market the week of the regularly scheduled May meeting we decided to push the meeting back a week to May 24th. Everyone that is going to Market will share what they saw at the next meeting. Finally, THANK YOU everyone for bringing treats and drinks in celebration of Sewtropolis’ new location. I appreciate everything! See you all May 24th!